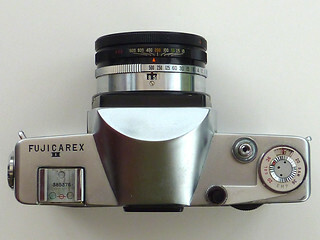 The Fujica Fujicarex II was introduced to Europe in about 1963. There was also a 1962 Fujicarex sold only to the Japanese market and a 1964 Fujicarex SLR 35 for the US. There appears to be no difference between the three cameras. The Fujicarex seems to have been produced for just a few years. 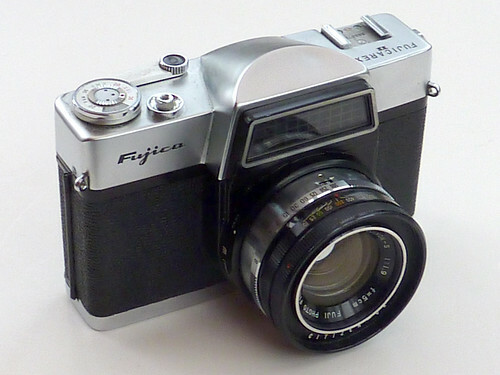 The Fujicarex is a 35mm SLR with an automatic diaphragm and instant return mirror. Focusing is via a ground glass screen with a split image rangefinder, which is operated by a thumb wheel on the back of the camera top-plate housing. The rangefinder provides a three-way split, so a central section within the circle is the bit that moves. The camera also features a selenium powered shutter priority, match-needle, auto-exposure system. The meter needle is visible through the camera viewfinder, and also operated by a second thumbwheel on the back of the camera top-plate housing. Aperture selection is coupled to the meter, so the thumbwheel sets the lens opening size, but the diaphragm remains fully open until the moment of exposure. A preferred aperture can be set manually for non-automatic operation. The aim of the control cluster was to make a camera that was operated with just the right hand; focus, exposure, shooting, and wind-on. The left hand role was reduced to the single task of steady support. The lens (an f/1.9 50mm Fujinon-S) is not removable, but the front element is, and alternative 35mm and 80mm lenses were available, plus a close-up attachment. The camera has a leaf-shutter (a Citizen QR), a depth-of-field preview button, and separate meter scales for 160, and 64/32 ASA films. The ASA selector ring is not graduated for these film speeds (just for 10, 25, 50, 100, 200, 400, 800, and 1600). This page was last edited on 16 February 2019, at 07:42.